First of all, where did the prosperity message come from? It seems to be a new message that has stemmed out only a few years ago. Billy Graham, Smith Wigglesworth, John Wesley, all the pastors of the old age who’d given themselves wholly to the Lord never preached this prosperity message, at least not in my knowledge. So why is it that all we’re hearing this new message? First, let’s look at the state of the modern church. When you think of a church, do you still picture the small wooden building, polished wooden pews lining the auditorium in even rows, and an altar up front? Or do you picture a large, stadium like complex, where thousands of people gather to sing, worship, and listen to a preacher speak through a microphone? Unless you go to one of the former types of churches (and there aren’t many of them left) you’ll more than likely be picturing the latter type. The sad truth is, church has become an institution. Instead of finding inspiration from the Holy Spirit, we find inspiration in theology classes. Instead of a singer with a single guitar on stage singing to the Lord, we now have a full rock band singing for the audience. Instead of a preacher speaking of God’s love and grace, he now speaks of God’s blessing and inheritance. Prosperity. Not that those things are bad, but we’ve let them take the focus off of Christ, and onto the business. More money equals bigger upgrades, and it goes on and on. If you’re having trouble believing, just go and buy Hillsong pastor Brian Houston’s book, We need more money. So far I’ve shown you the state of the church, but what good would this post be if I left it at the fact they they’ve turned their focus from God to money? So I’m going to give you my take on it. The Bible does say He will bless us. It says that He wishes that we may prosper and be in good health, even as our soul prospers. The thing is, we believe that money and worldly possessions are where our prosperity lies. 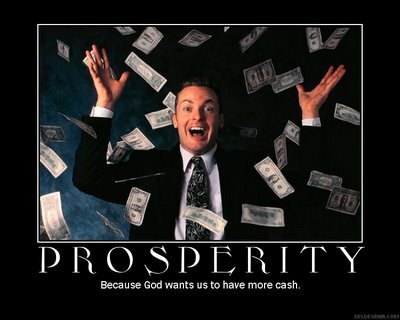 The truth is, God doesn’t see prosperity that way. If I asked you, “I want you to give away everything you have,” what would you do? Notice I say have, not own. That includes those around you. You’d give away your possessions before you gave away your wife, or your brother, or your children, wouldn’t you? The Lord doesn’t say He’ll bless your life with money or material possessions. He will bless your life with Himself. Christianity is a relationship, and relationships aren’t found in material gifts, they’re found on acts of love and commitment. Jesus gave His life on the cross in order to cut off the separation between us and God. True prosperity is living in the freedom of His love and grace. Living in His presence and reflecting His heart to those around you. Prosperity is found when we give it away. We don’t need more money, we need more of Christ. The greatest gift of all, is Love.